New to BeerMenus? No worries! In this article you will find some of the basics to get you started. if you want to check out what we are all about you can visit this page first: About us! If you have any direct questions that you were not able to answer below, feel free to email us at support@beermenus.com for the quickest response! BeerMenus primary function is to connect consumers with the beers that they love and the local businesses that are serving them. You will want to follow the below steps to get started! You will want to first add your business so that you can start reaching the BeerMenus community. 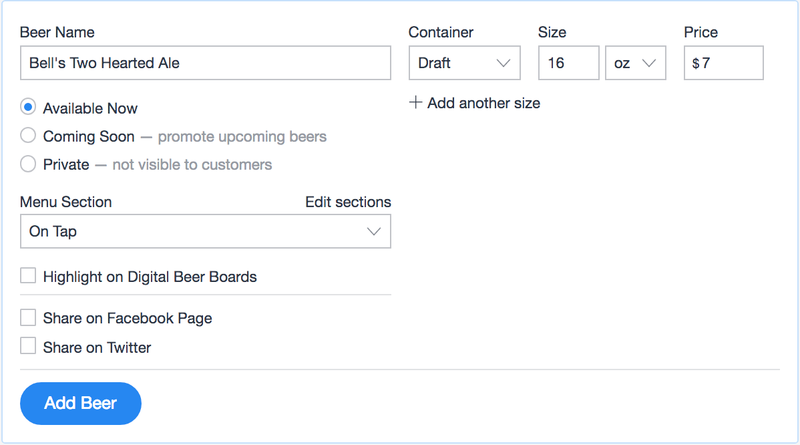 You'll find the "Add Business Button" in the top right corner of any page on BeerMenus. You may have added your first few beers already but, everyone can use a refresher! 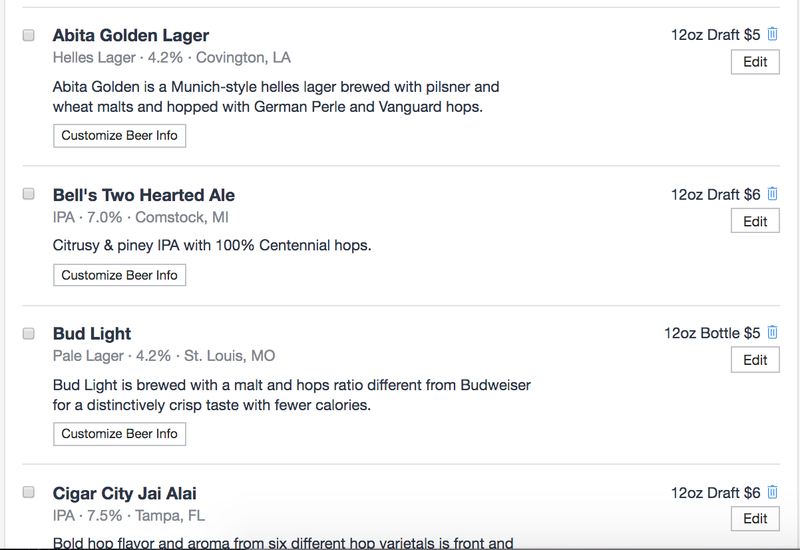 Adding beers to your list on BeerMenus is as easy. You will first want to get to your "Update Menu" page. You can find that button on the top right of your page. BEER NAME: This is where you type in the name of the beer. We have an extremely robust database of beers from all around the world, once you start typing you should see the name of the beer that you are looking for and select that from the list. 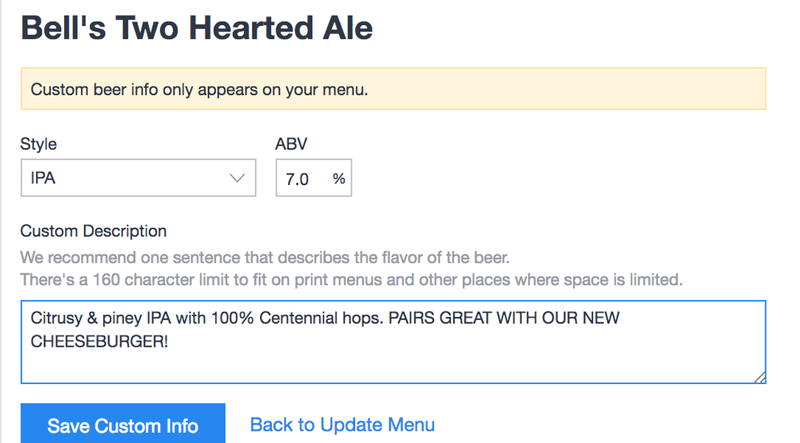 Once the beer is selected, the information like a description, brewery info, ABV, style, etc... will all be added automatically. CONTAINER: Draft, Bottle, 4 Pack Cans, 6 Pack,Growler, Crowler, Keg, etc... Any way you are selling your beer you will find it. PRICE: How much are you selling it for? Available Now: These are the beers that you are currently serving and want to be viewed by the BeerMenus community. Coming Soon: Got a great beer in the fridge coming up that you want to generate buzz? Put it in the "Coming Soon" section so that users can see that it'll be available soon. Private: The "Private" section is for you to put selections that you do not want currently viewed by consumers. This is a section designed to help businesses organize their menus and save time. The Private section is great for a beer that you just kicked and may bring back on soon. Move it to private and keep all your information saved to reduce updating time. At the bottom of the dropdown list for the menu sections, you will see the option to add a "Custom Section." This works great if you have certain beers that you want to highlight for a Happy Hour section, or as only available on your patio. Another great example would be highlighting the specific beers that you might be using in a tap takeover. If you scroll down the list on your "Update Menu" page you will see the full list of beers. To remove a beer from your list, all you need to do is click the small blue Trash Can icon next to the serving that you would like to remove. Once you click that blue trash icon, the beer will be removed from all your menus (print, website, digital). These changes will reflect across all your menus, so if you want to include some other information on your print menu you can really be creative! This should cover most of the basic in and outs of getting going on BeerMenus. If you have any questions that you were not able to answer from this article please try searching above, or contact us directly at support@beermenus.com and we will get back to you as quickly as possible!